I think I'll get Cogman and Drift and probably none of the other new reveals. I would get Devastator, but Siege has made that...financially unrealistic we'll say. Ironhidensh wrote: I dunno. When I was young and had no to very little money, I'd buy everything I liked, and a lot I didn't, and almost never worry about price. Now, comfortable in life, and with plenty of disposable income, price has become one of my number one determing factors in buying figures. Looks great and i would be all over this if Hasbro didn't both up the scale so much. Some folks and Hasbro can say it is accurate, but it is as Obvious as a sore thumb that it is not. Pre-ordered DOTM Optimus! Now I just have to wait. . .
. . .a little over 6 months. At least I'll have wave 5 to tie me over till then, I'll be picking up DOTM Megatron in about a month. Sideswipe, WWII Bee, and maybe Barricade at some point too. The thought of possibly getting this in Leader-class form...drool. Motto: "Nobody has to look for trouble." Can you convince me to buy this guy by showing me that his lower legs aren't as kibble-ridden as I've seen? It seemed like they stuck out really far to the rear. Thanks! So he dethrones his ROTF figure for that title? Hard to say, I can still vividly recall how painful it is to tab the first one together, despite having not done it for a decade, but this one is arguably more annoying cuz they're all right there, about a millimeter away and nothing stays together. 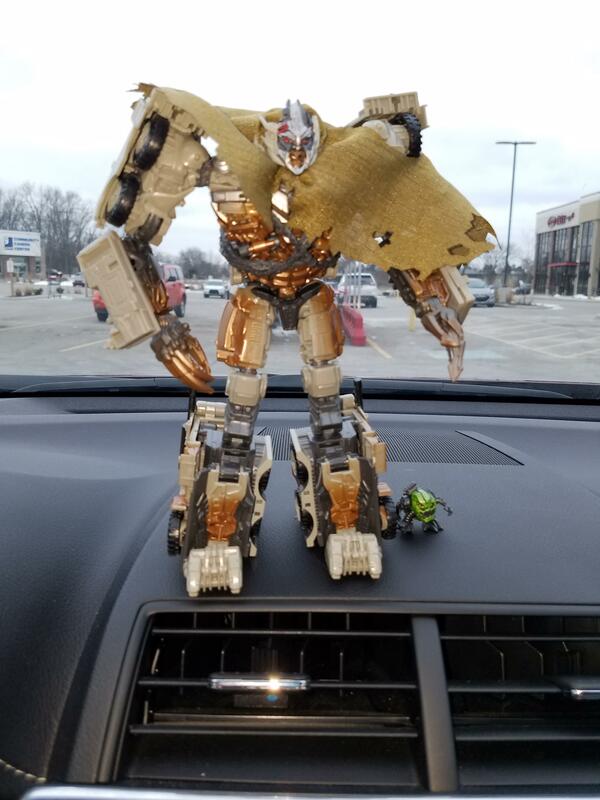 So, as is my fashion, I got some stuff off my chest about jetfire, and some stuff out of one of his connectors, and have officially gotten him transformed, I found that 'doing a jazz' helps to get him into vehicle mode because he does just have a bunch of stuff flopping around until all's said and done. That said his need to align everything is up there with the worst of them, despite my cleaning out one of his key tab ports. And honestly the only problems are those flaps that hang out beside his neck, I swear the 4 tabs on them are definitely not in the right place to line up with what they need to tab into. He does some amazing stuff with his transformation though, and it astounds me that he can have as tidy a vehicle mode along side such an accurate robot mode, and a pretty great combined mode; it's hard to believe this is only the second time visiting this design and they really nailed it, it's nice that they sat down and put in actual places for the belts to in both modes, that really helps the figure. 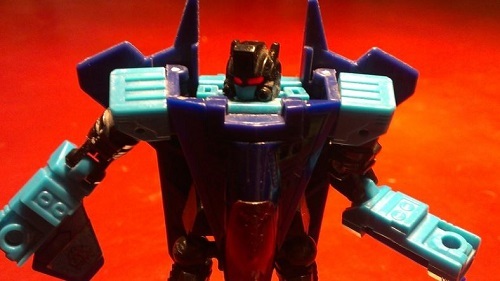 But, in the end, I feel the same as I did in my first post about him; if you need a jetfire, look no further, but if you want a cool blackbird, just get a model kit; and if you want a flying o/p, I think the new leader class one should get you what you want, because, he really is a lot of grief wrapped up in some glorious packaging. You dont find the face too big? william-james88 wrote: You dont find the face too big? Wow, some awesome stuff revealed! Hightower makes for a great Constructicon member of the team, and now we have 4 of 8 revealed! 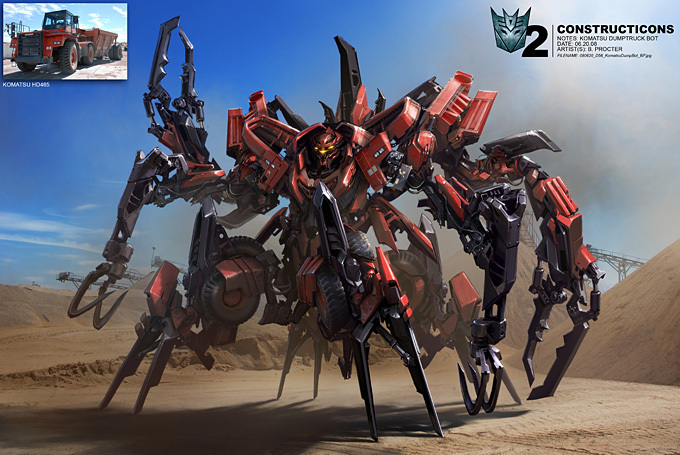 I don't think they've really missed a beat yet, and I'm so glad we are getting Hightower in his concept art design. Awesome. Drift is a great surprise! The Dropkick mold is pretty lackluster to me, but Drift looks a lot better in it. And we'll have a car Dropkick, so Dropkick himself is avenged. Also kinda funny that both Drift and Dropkick are blue triple changers that use a sportier/expensive car and a helicopter for alt modes and both start with D. I find it funny. KSI boss is a pass, got the awesome mold twice in its best forms. Leader Prime is a WOW! Love the jetpack and weapons ring! Never thought we would get that! and he has the Ax! The weapon i most wanted him to have! I'll need both the regular voyager for Jetfire and this leader for his flight tech. This is awesome, Prime truly has won the day. Anyone who has both current SS Primes, would it be possible to transfer SS-05’s lower legs onto SS-32? Anyone know where I can get SS38 Optimus Prime now? I've not had any real issues getting Jetfire into blackbird mode. A couple panels were hard to fit at first but after some smooshing bits they all fit quite securely. It's just his whiskers underneath the front of the jet that spoil the look somewhat but overall he's great and just a really fun leader class toy too and of course the bonus of being upgrade for SS32 and DotM Prime is fantastic. 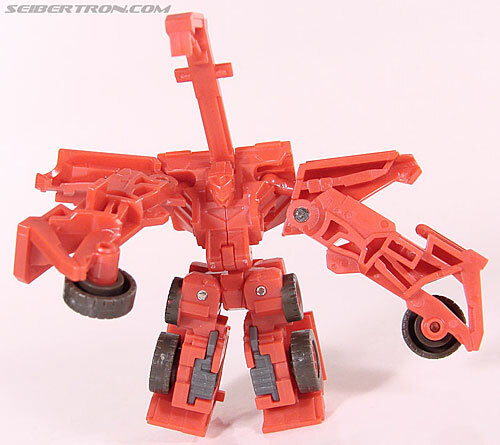 EvasionModeBumblebee wrote: Anyone who has both current SS Primes, would it be possible to transfer SS-05’s lower legs onto SS-32? SS32's lower legs can be easily removed since they're attached by simple screws. SS05 uses... I dunno what you call them but they ain't screws. Nothing to grip onto. Something fun to try if you have Studio Starscream and the 2009 RotF mold too. Use that outdated figure to super hulk out the Studio figure! I know this is third party upgrade but i couldn't find the right thread and it's such a much needed upgrade about the one really bad thing about Studio Ironhide I thought it be ok here? Move it if I'm wrong please and sorry. 4,829 pages were recently viewed by 834 unique visitors. This page was viewed 1 times on Monday, April 22nd 2019 1:06pm CDT. © 2019 Seibertron, Inc. DBA Seibertron.com. All Rights Reserved. Established June 2000. Seibertron.com is owned by Ryan Yzquierdo.